This is the second page of Chronic Fatigue Syndrome prayer. Please join your mind with all who visit here or are part of the facebook group. You may have the illness yourself or you may be watching someone you love experience the changes it brings to their life. Either way, it is easy to feel powerless when faced with the experience of chronic illness. A practice of prayer allows you to claim the power to hold a vision for positive change. On this page I primarily use the term Chronic Fatigue Syndrome rather than Myalgic Encephalomyelitis (I have been given both diagnoses over time). Please adapt the wording for the diagnosis you have been given or prefer. The Chronic Fatigue Syndrome prayers are allocated to a day for those who choose to say a prayer a day. They can of course can be said at any time! Click or just scroll down. THURSDAY. Chronic Fatigue Syndrome Prayer for treatment to be available and effective. On alternate Thursdays: Myalgic Encephalomyelitis prayer for wise media coverage. FRIDAY. Prayer for CFS/ME to be met with kindness and dignity. On alternate Thursdays you might choose Myalgic Encephalomyelitis prayer for wise media coverage. Please guide doctors and alternative healing practitioners in providing treatments for Chronic Fatigue Syndrome /ME. Lead them to accommodate the restrictions of illness so treatment can be accessed and the benefit of treatment can be felt. Bless them in their marketing and their finances so they are found by the people who need them. Help them to be comfortable in their areas of not-knowingness and their willingness to learn. Guide them in all wisdom. Bring healing to their hands, hearts and minds. We see doctors and practitioners finding richness in their encounters with people with Chronic Fatigue Syndrome /M.E. We see them providing successful treatment. We see the person with CFS/ME finding a doctor or practitioner who can help them. 5b: Alternate Thursday: Myalgic Encephalomyelitis/Chronic Fatigue Syndrome Prayer for Wise Media Coverage. On alternate Fridays you might choose Prayer to ease loneliness in a time of chronic illness. We pray for structures to be put in place so that each person with Chronic Fatigue Syndrome-ME is treated by officials with dignity and respect. Guide relatives and friends to show kindness towards the person with CFS/ME. Guide each person with CFS/ME to receive and enjoy the kindness and help they are given. We see them with a clear sense of their worth. We ask that even when the world does not give someone with CFS/ME reason for confidence, they receive confidence through their knowledge that they are part of you, part of Love itself. We are yours and we are loved. There are times when we haven't been treated with dignity, respect or kindness. It hurts. We offer that hurt to you. Guide us please. Give us emotional healing. There are other times when we receive kindness and we don't fully receive it. Sometimes it's easy to just feel like a nuisance. We wish we were the one helping and not the one being helped. Thank you for the kindness we receive. Help us to receive it fully. Bless in abundance those who give it. At times when the world doesn't give us reason for confidence, we receive confidence through our knowledge that we are part of you, part of Love itself. 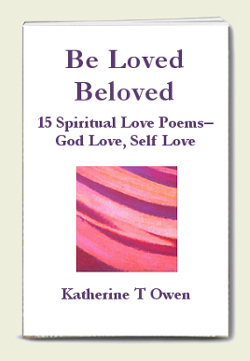 We are willing to know our beauty in you. 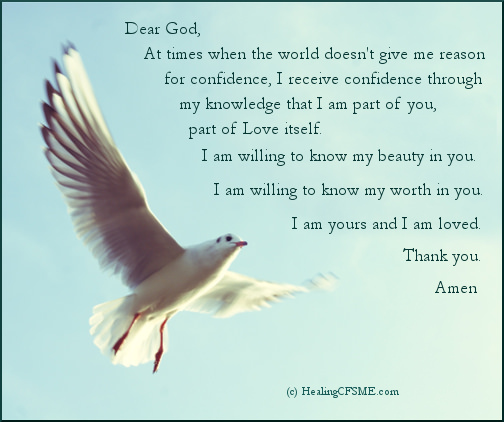 We are willing to know our worth in you. We lift to you in prayer the family and friends of a person diagnosed with Chronic Fatigue Syndrome, Myalgic Encephalomyelitis or Fibromyalgia. We offer you any distress they feel about the pain they see this person going through. We offer you any anxiety they feel about their ability to cope. We offer you any anger or frustration they feel towards the person who is living with illness. If someone has treated someone with CFS/ME without kindness, guide them to ask for and receive your forgiveness. Strengthen a family member or friend to be able to deal with the changes that the illness brings to their own life. We see these people drawing on your strength and finding out that your strength never fails. God, pour out your blessings on all those with a family member or friend with Chronic Fatigue Syndrome. We see them learning how to be of help, and persevering even when they make mistakes. We see them finding the strength to be the person they want to be. We thank you for all those who help or find kindness in their hearts. We ask that a friend or family member of someone with CFS /ME is blessed with the pleasure of loving, the pleasure of being of service, and the pleasure of a life in which they claim the power to make a difference to the life of another. Guide them to see the person and not just the illness. 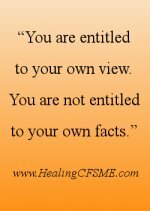 Guide them to receive the gifts that the person with CFS/ME has to offer. Thank you so much for joining in these prayers for chronic fatigue syndrome causes. God bless you and lead you into all joy. Click here for a page which includes Chronic Fatigue Syndrome prayer for spiritual healing, for successful research, for those involved in CFS/ME support groups or advocacy, and for financial provision. Click here to go through to a prayer to ease loneliness when living with severe chronic illness. 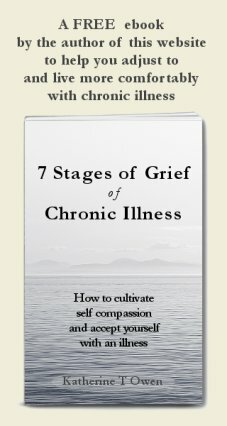 Learn about my own journey with CFS/ME. Or move from ME/ Chronic Fatigue Syndrome Prayer to pray the healing prayer for physical healing for yourself or for a loved one. Please also consider reading out the names of those who have asked for prayer.